Henry Rowley Bishop was the author of opera's, operetta's, songs and theatre music. After his stage succes with "The Maniac" (1810) he became musical director of Covent Garden and held this post for fourteen years. He wrote the music for Byron's "Manfred" that was first produced in 1834 at Covent Garden. The music was used for further productions of the play until in was replaced by Robert Schumann's music. In 1831 he married his second wife, the young pianist Anne Rivière, who had been his pupil and was 23 years his junior. In 1837 she turned to singing and soon she fell in love with her accompanist, the harpist and conductor Nicholas Bochsa. In 1839 she left Bishop for Bochsa and ran off with him. In 1842 he was knighted and in 1848 he was appointed Heather Professor of Music in Oxford. His professorship ended in 1853 and allthough he had earned a substantial amount of money during his life, he died in poverty in London in 1855. Among his most famous songs was "Home! Sweet Home!". 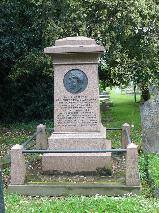 The grave of Henry Bishop at Saint Marylebone Cemetery, Finchley London.